You wouldn’t believe it but the majority of people who cook pork chops get it wrong nearly every time, by overcooking them. Not only that but they take them right out of the fridge and into the pan which is a big no! You should always let your pork chops sit on the side for a good half an hour before beginning to cook them. The simple reason being is that the pork chops will overcook on the outside if it’s too cold. So you first tip to cooking pork chops correctly is to let them rest on the counter, this will reduce the chances of you cremating the outside. 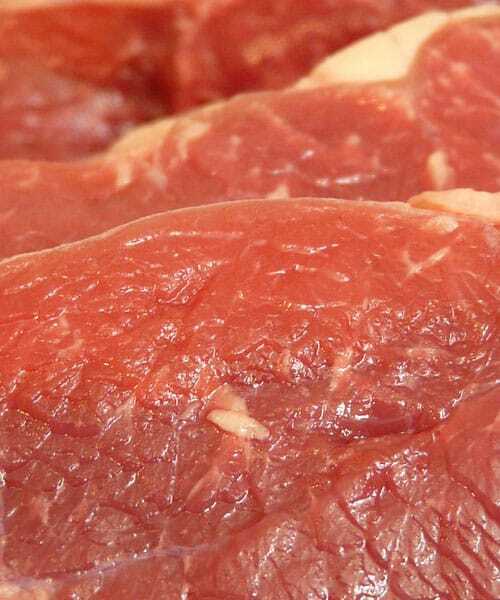 However, there are more top tips that we would like to offer you when it comes to cooking pork chops. The biggest problem we face when cooking pork chops is that they dry out fast and you are left with a pretty woeful looking bit of meat. 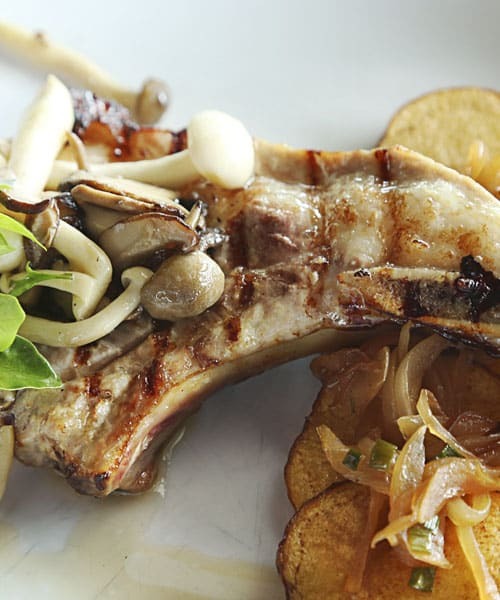 What you want is a nice and juicy pork chop that surprises your taste buds and leaves you with a great experience. Cooking on a medium heat is the best way to do this, or start on a high heat to get that moorish golden crust, but then bring the temperature down as soon as the crust starts to golden up. Keeping a medium heat right the way through the cooking process will allow the outer part of the chop become tender while the centre gets to the correct temperature for the perfect pork chop. What you also need to take into account is after the chop has been cooked, because far too many people cut right in and start eating. Don’t! Just like you left the pork chop on the counter for a half an hour before cooking it, you want to leave the chop a good ten minutes after it has been cooked. What this does is allow all those juices inside to redistribute across the pork chop to give it that fantastic taste. 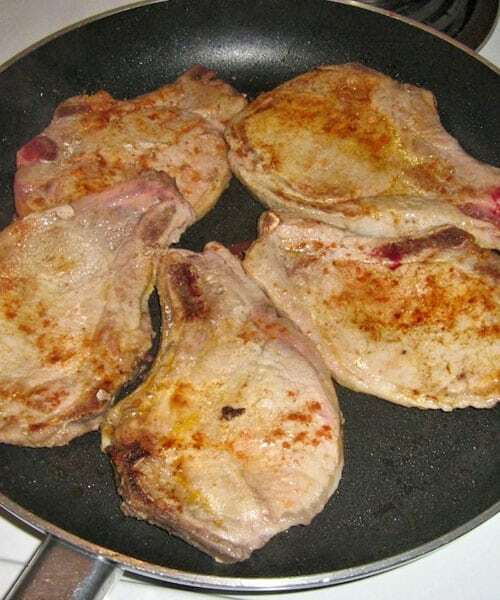 If you cut right into the pork chop as soon as it comes out of the pan then you are going to let the juices run onto the chopping board and those beautiful tastes will run away with the juices. 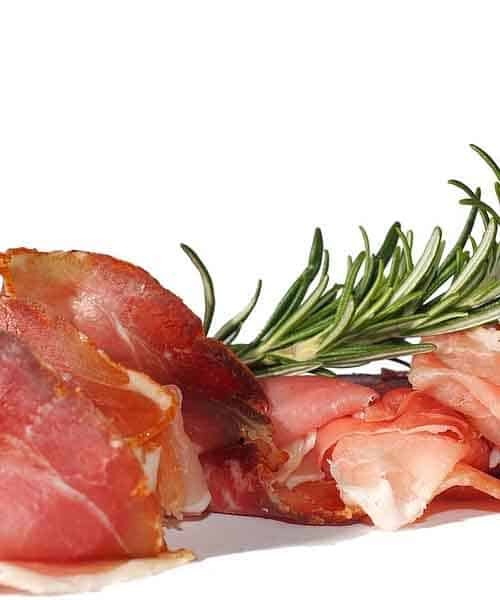 Like most meats, there are a variety of different ways to cook them. Some of the ways are fast, some are slow and nearly all leave the pork chop with a different taste. One of the best ways is to skillet cook them and then transfer them to a preheated oven to finish the job off. Get your pork chops and rub both sides with a little olive oil and then season with salt and pepper. Now lay the pork chops on an already preheated skillet on the oventop, and turn the heat up high to give that golden crust. You will only need to do this for 30 seconds before bringing the heat down to medium. Usually a good 3 minutes each side is all you need here before we transfer them to the oven. You want to see a golden finish to each side of the pork chops, and if you get a bit of smoke don’t worry that’s fine but turn the heat down if the smoke becomes too much. You are now ready to transfer them to the oven for the final part of cooking. Now, cooking time varies depending on the thickness but if you have a thermometer then you are looking at a temperature of 145F at the thickest part of the pork chop. Usually an additional 6 – 10 minutes of cooking time in the oven is all you need here, so it’s worth checking the temperature at the 6 minute mark and then rechecking each minute until you hit the 145F mark. As soon as they are cooked take them out and let them rest for the magical ten minute period before you get stuck in, we know its tempting but that ten minutes will make all the difference to the taste. Once cooked you can now serve up the pork chops. 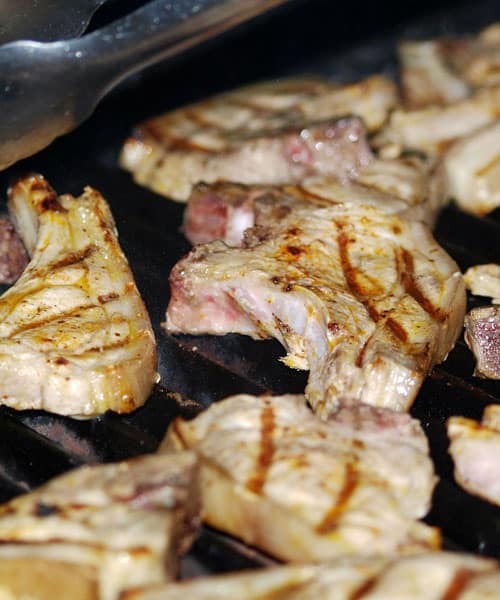 Before you even begin cooking them there are optional things you can do to experiment with tastes, one of those is to let the chops rest in a brine water with flavourings. Usually cold water, 3 tablespoons of sea salt and some crushed garlic cloves will enhance the flavour of your pork chops and provide a wonderful taste. You can also chuck in some black peppercorns and a bay leaf, or anything else that you think will compliment your pork chops. The choice really is yours here, and then you can begin the cooking process. 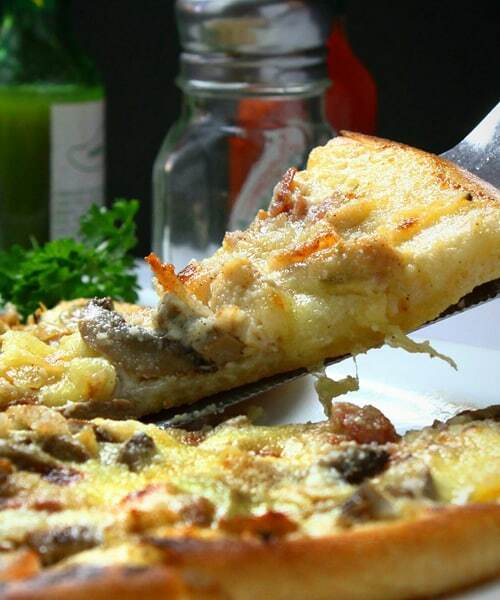 Pizza is a food that we enjoy across the world, whether we indulge in the dish as a snack or include it as part of a dinner there is no getting away from the fact that it’s one of the most popular dishes. However, cooking your own pizza from the comfort of your own home isn’t as hard as it sounds and it’s considerably cheaper to do. Forget about the fancy dough spinning you have probably seen on the TV, and prepare yourself for a selection of great tips that we are about to give you on how you can make awesome pizza at home. 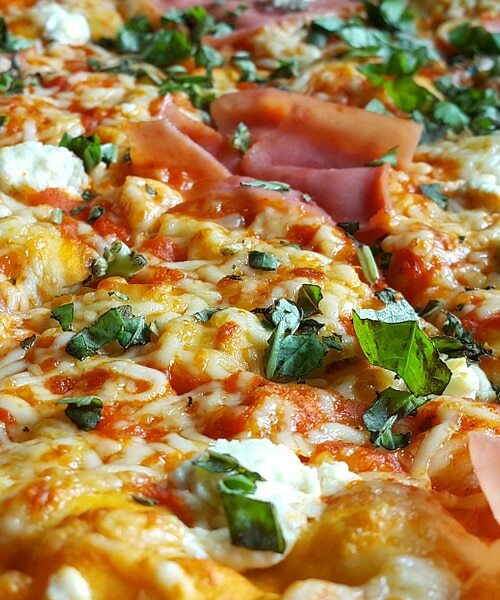 Pizza at Home – Our biggest tip! Firstly, we have to start with measuring your ingredients, and in our opinion a lot of homemade pizza bases tend to go wrong at this very step. 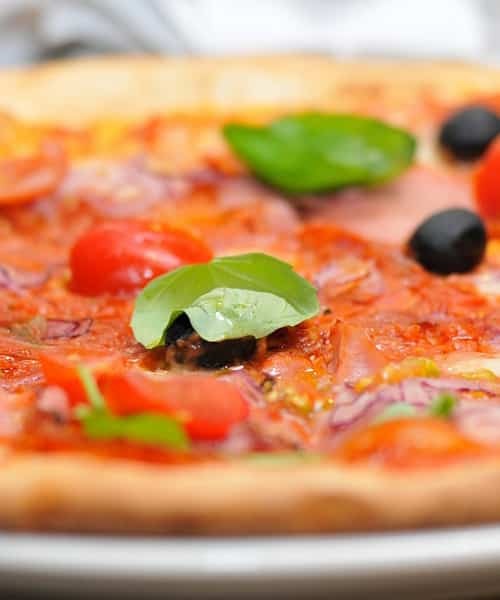 If you get too much or too little of one type of ingredient then you are heading down a slippery slope of disaster when it comes to creating an awesome pizza. For many people they tend to give up for good, but just by using a set of good measuring scales you can forget about all that worry and get it done right! It all starts with the ingredients and how big you want the pizza to be, for the purpose of today’s article we are going to look at how you can cook a 10-inch pizza which can serve 3 people. Note: you can either pre-make the dough at home if you know how to or you can head to your local grocery store where you can pick up some that has been already made. The latter option is the ideal one if you don’t want to have to measure your ingredients prior to making the base, and also serves as a time saving options when you need to cook a pizza within that 30-minute mark. Your first step should be always to pre-heat your oven and its usually good practice to set the oven to its highest setting at this stage as you will benefit from a nice crispy and crunchy crust to your pizza. Leave the oven a good half hour before you place your pizza into it, which will give you enough time to start making your pizza base. There are many types of method on rolling out your dough, from the type of flour you are using to the type of parchment or baking sheets you choose to use. For this method we are going to use the popular choice of baking a pizza on a baking sheet. Firstly, tear off a good sized baking sheet and then brush it over with some olive oil so the pizza base doesn’t stick to the sheet. 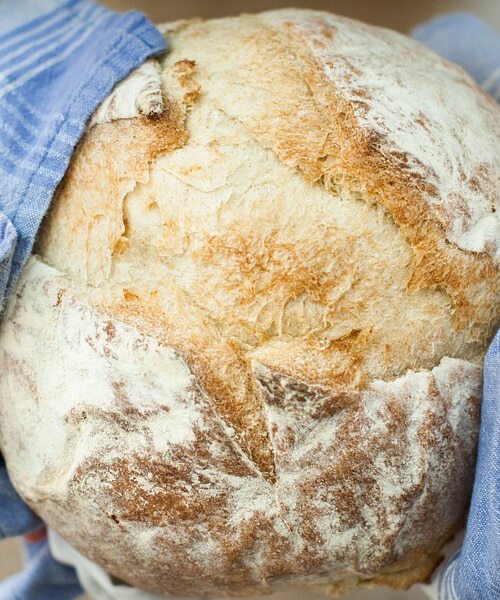 Knead the dough into a circular shape with your hands, pushing out from the middle and then use a rolling pin if needed to flatten the dough to around ¼-inch thick. Take a good 5-10 minutes in getting this step right as the perfect base if a fundamental part to a perfect pizza. 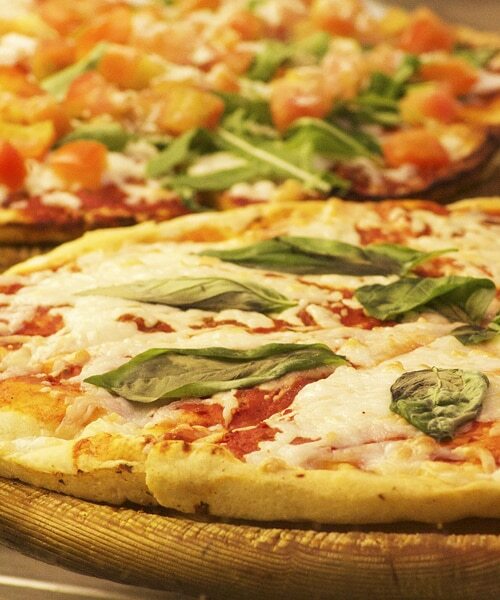 The best part of making any homemade pizza comes with the decision on what delicious toppings that you want to cook with. Firstly you will want to pour over some tomato sauce (passata will do nicely), and then with the back of a spoon circle the sauce around the base until it is evenly covered. Once you have done this throw on your onions, mushrooms, pepperoni and anything else you wish to complete the pizza with. This is another step that people tend to get wrong and overcook the pizza by leaving it in the oven for way too long, or they end up with a pizza that has been cooked nicely on one side but undercooked on the other side. Slide your pizza into that high-heated oven and then bake it for around 5 minutes, and then take the pizza out and rotate it, cook again for another 5 minutes. That’s it! Check to see if your crust is nice golden brown and the cheese has melted to a satisfactory state onto the pizza. If you are happy with the look of it, gently and carefully take the pizza out of the oven. Step 5. Serve to your guests or eat yourself! Decisions, decisions! You may have just pulled out possibly the best pizza you have ever made and now you have to share it with friends of family. Whatever the reason was in cooking the pizza you have one last step to perform and that is slicing the pizza. 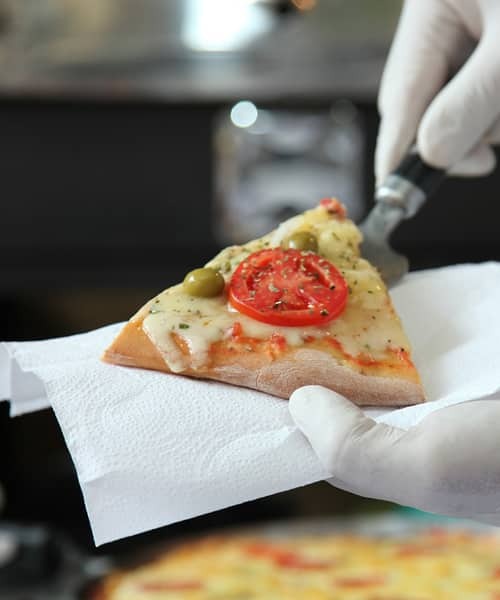 Firstly let the pizza cool, we know that temptation can easily get the better of you here but cutting a cooled down pizza is much easier and you won’t burn your hands. Once the pizza has cooled down slightly you can now use a pizza cutter to cut the pizza into slices. 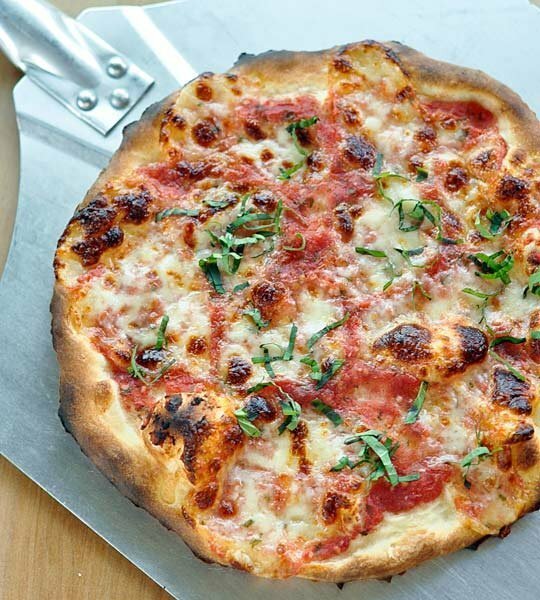 There are many ways to create a pizza base, some are left overnight, and some are cooked under a grill, so it’s up to you to find a way that best suits your needs. 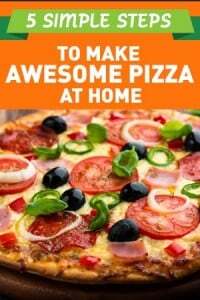 The method we have given here is the easiest and quickest way to make a base and create a pizza without needing any extra knowledge. 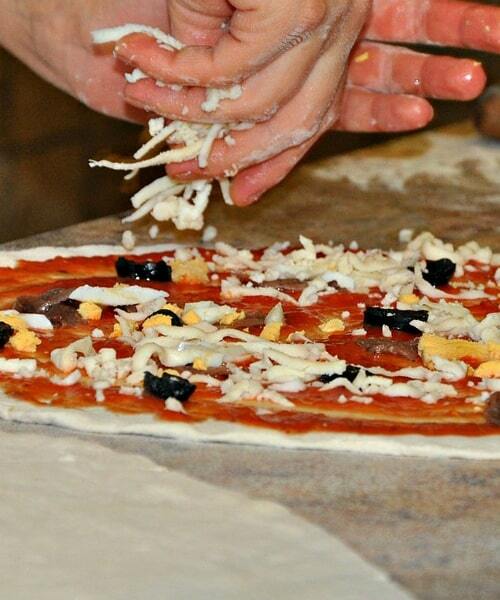 Above all, just enjoy experimenting and finding different ways of making the perfect homemade pizza. 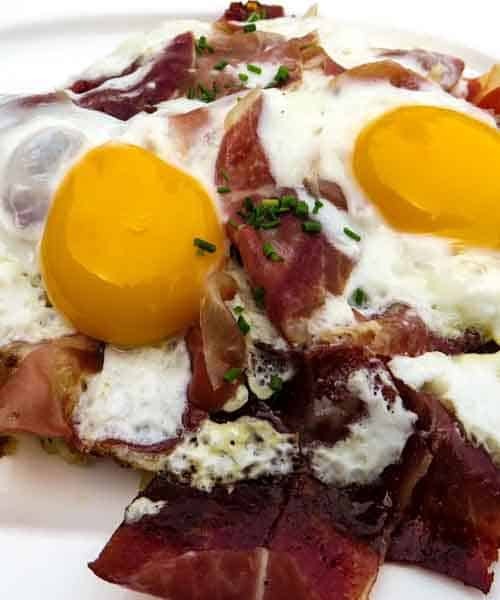 The classic way of cooking bacon is to use a frying pan or griddle; these are usually the quickest and most effective ways of getting the meat cooked. If you decide to use this method to cook then you can cook 3-4 rashers in a decent sized frying pan but make sure that each rasher is lying flat on the pan (no overlapping). If you are using a griddle then we suggest a heavy cast iron griddle is the best choice but any griddle will suffice. One big tip is that you don’t need oil, the grease from the bacon itself will provide enough fat to cook each rasher in. When the bacon begins to curl up you can then turn the bacon onto the other side in order to get both sides cooked properly. Usually it takes about 8-15 minutes to completely cook bacon using a griddle pan or frying pan. 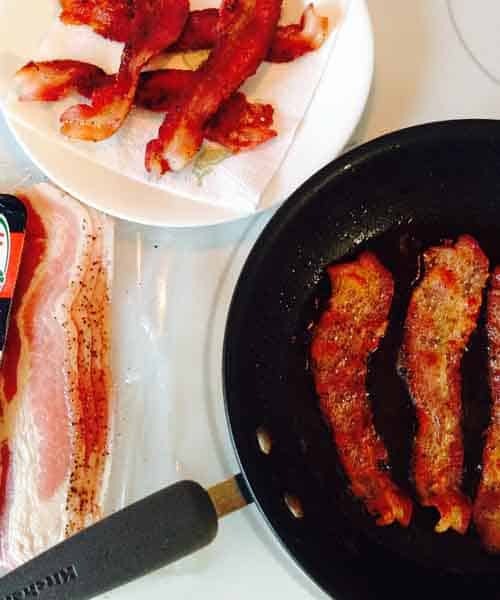 Top tip: Keep the heat on a low-medium or the bacon may stick to the pan and be hard to remove. 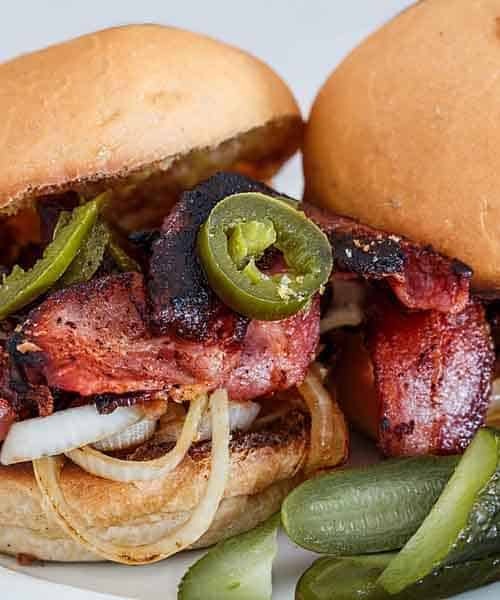 The second popular way to cook the salty delight that is bacon, is to oven cook it. It has to be said that this method is much cleaner than frying the bacon as you won’t have that splatter across your counter tops. Fire up your oven to around 400F and then place the bacon on a middle shelf where the heat is at its highest temperature. The bacon rashers will take less time that frying and you can expect a complete cook in around 10 minutes using this method. 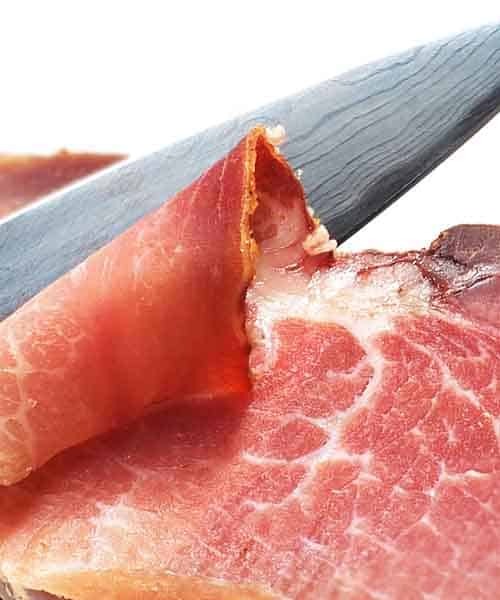 Top tip: To keep things clean make sure that you use aluminium foil to line your backing tray or grill, this will help collect the fat that drips from the bacon and saves you from having to clean the oven tray after use. This may seem like a strange way to cook bacon, but never neglect your microwave as a form of cooking, it may seem like a bit of a cheat but it really can work wonders for you. Take the bacon rashers and pop them onto a plate, then cover the plate with some paper towels (this is to help control the grease that will squirt out from the bacon when it’s cooking). By using the microwave as a form of cooking you can literally get your bacon from raw to cooked within about a minute per slice. So if you have 4 rashers placed onto a plate you will need to set the microwave to a high cooking level, and then cook them for around 4 minutes. Of course, if you want extra crispy bacon then you should add another minute onto the clock which will give you that crunchy texture. The final method that we wanted to look at was how to cook bacon under a grill, this method will cook the bacon in about 10 minutes if you flip the rashers over after 5 minutes of cooking. You don’t want to cook on a high heat however, which is something that many people do. 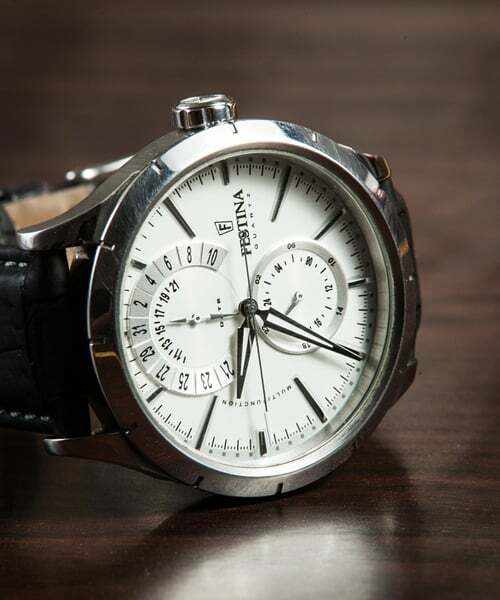 You want a medium-high heat which will give you a great tasting result. 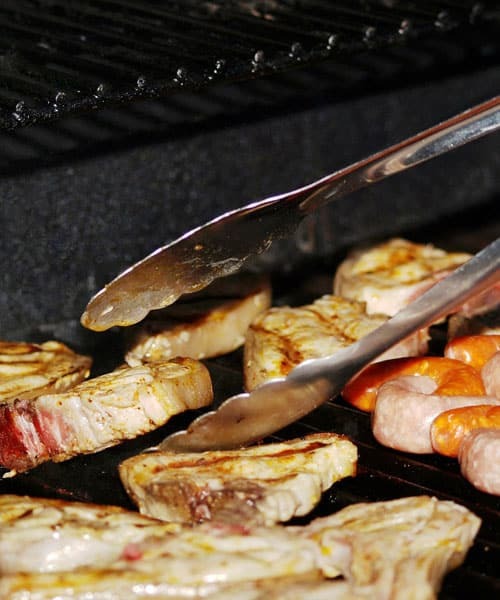 Be careful of the grease splatter as you won’t be able to control this and more often than not you are going to be left with a clean-up job at the end of cooking in order to de-grease the grill filaments. 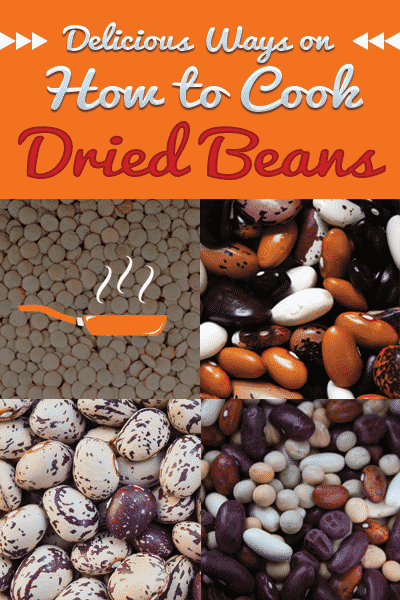 Once cooked, go ahead and enjoy as part of a breakfast, lunch or tea time dish! Asparagus is arguably one of the best things you can eat because it contains so many good nutrients. 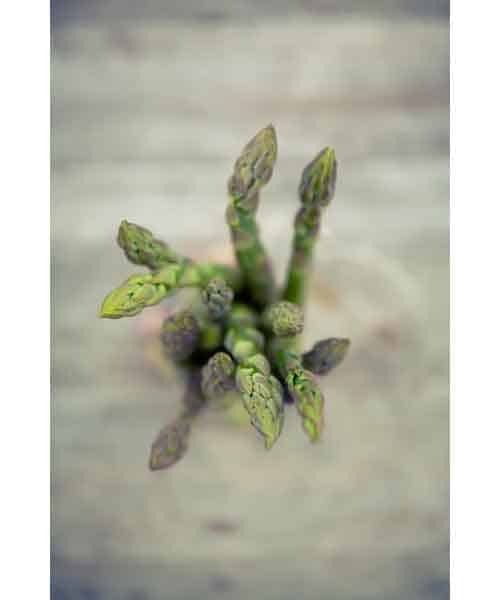 Fresh asparagus can be part of a tasty dish, and will fill you with calcium, iron, vitamins A and C and even potassium. The only downside is that people just don’t know how to cook the fresh vegetable, and even if they do they have no idea on what dish to put it with. Luckily for you guys we are about to show exactly how asparagus can be cooked and what meals it complements. The first and most important point in getting your asparagus ready to cook is cleaning it. This a step overlooked by many people but please don’t neglect this step. Why? Well asparagus is grown around sand, and the very tips of the vegetable have plenty of cracks and crevices where the sand can creep into. If not washed properly you are going to get a crunchy, gritty taste in your mouth. Run the asparagus under cool water which should remove the sand. After you have done this you will want to chop the base ends off your asparagus as these aren’t really palatable, unless you like eating tough wood! Usually a 2-inch chop is enough to cut the unwanted base away. Now we get stuck into some of the ways you can cook this delicious vegetable. There are three many healthy ways and they are to steam, boil or to blanch. 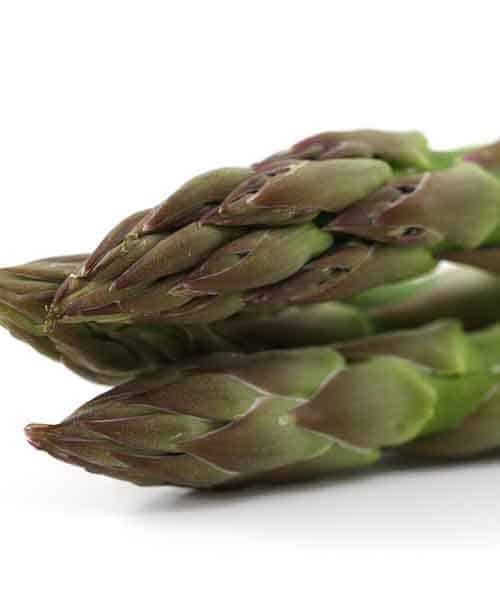 Blanching is notably the most popular method as asparagus doesn’t need long to cook. Just get yourself a bowl of water, drop in 2 teaspoons of sea salt and let the veg cook for about 2-3 minutes. You don’t want to overcook the asparagus as it will become limp and lifeless, you want an asparagus that crunches on each bite, so test a spear to make sure it’s ready to come out of the water. In literally 3 minutes of cooking and about 3 minutes of prep you have some tasty blanched asparagus to tuck into. Tip: Try serving it with a crispy fresh salad. The second way is to boil the asparagus which takes around 5 minutes but you need to keep a close eye on the spears because this veg is quick cooker and it takes just an extra 30 secs – 1 minute to ruin them. You don’t need to fill a saucepan to the brim with this method either, you only need enough water to cover the asparagus so a few inches deep with about 2 tablespoons of sea salt is all you need to do the trick. Tip: Place the asparagus into the saucepan when the water is on a rolling boil, and then cook for 5 minutes once the water returns to a boil. Finally we come to the steaming option which unlike boiling keeps a lot of the nutrients in the asparagus, and there is also less of a chance you are going to overcook it using this process. Usually you will need to steam them for around 7 minutes depending on what kind of steamer you are using, but just test one spear for crispiness before you serve up. 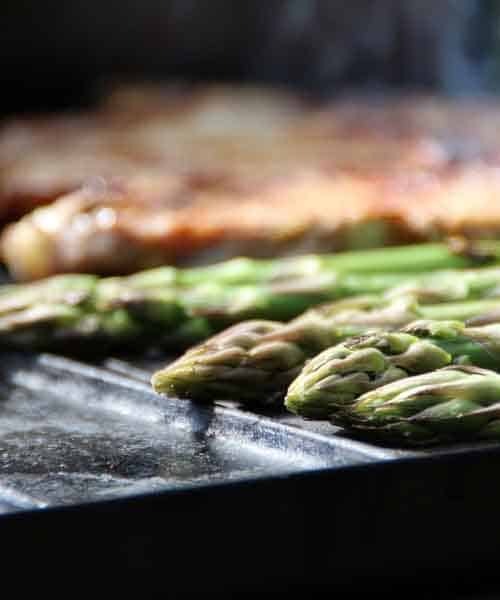 You can also roast and sauté asparagus for different kinds of tastes and finishes. The sauté option will allow you to create the beginning of a fantastic stir fry where you can add onions, peppers, mushrooms and carrots at the same time you add the asparagus. 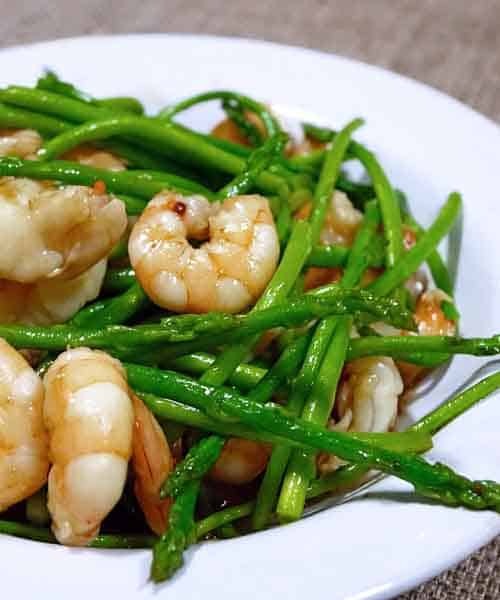 This crunchy little dish can be served anytime of the year and just adds an extra element into how asparagus can be cooked and then served. Asparagus is a very versatile veg that will go with almost anything, but surprisingly some of the best recipes are soups and chicken dishes. 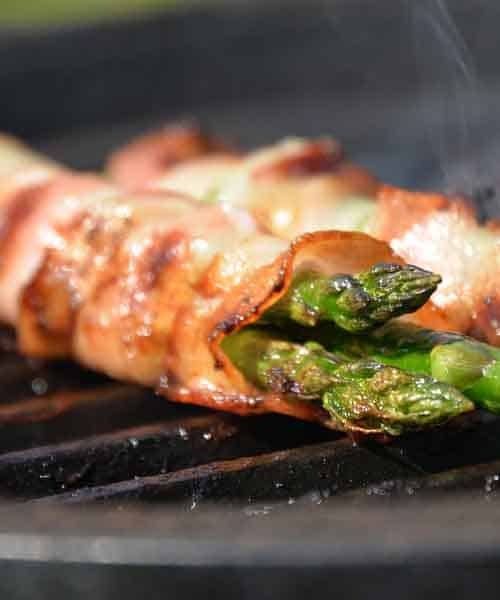 For example you can make a creamy potato and asparagus soup, or you can wrap bacon around your asparagus spears in a chicken and bacon dish. If you prefer a lighter bite, then you can add asparagus to summer dishes such as fresh salads or Asian spring rolls. The choice is yours! 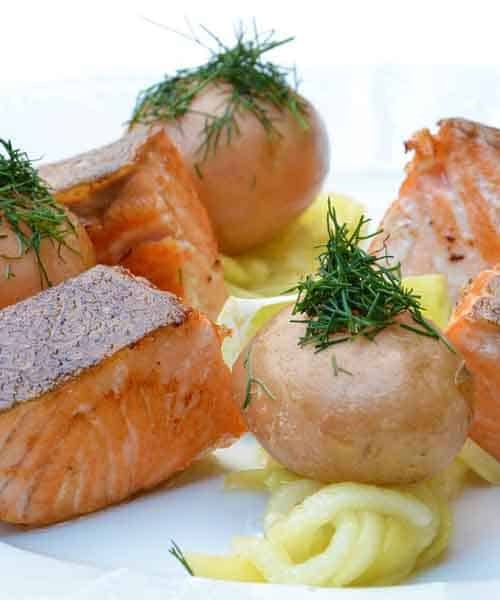 Salmon is very much one of the favorite types of fish out there, and with so many different ways to cook it, and more ways of complimenting it into certain dishes we wanted to show you 5 different ways that you can enjoy that next piece of Salmon that you guy from the local fishmongers, or grocery store. Take a look at these 4 unbeatable ways we have explained for you below. First of all, you need to think about how much time you actually have to cook the Salmon, by this we mean; are you in a rush? Or are you preparing a spectacular dinner party where time doesn’t particularly matter? The simplest way, and the quickest is to oven cook you salmon. With a little olive oil on the top and some sprinkling of black pepper and sea salt you are all ready to get underway. For each half-an-inch piece of salmon you want to cook it for a good 4 – 6 minutes on each side, and usually you find that the thickest part of most salmons usually averages around the 1-inch mark, so you can have both sides cooked in around 15 minutes. 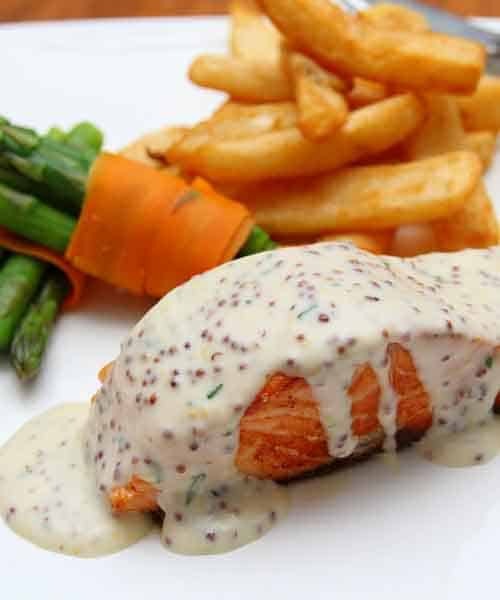 Now you are ready to eat the salmon you can choose some extra dressings, the obvious choice is lemon and fresh herbs that really bring out some of the flavors of the salmon, but you can also try pesto and other herbs and spices that may be in your kitchen cupboard. You would be surprised at just how much this cooking option works (with any meat or fish). Find a sealable bag and place you salmon inside, now start to dress the fish in a marinating sauce. You can use garlic, salt, olive oil, pepper, lemon juice etc. Once you have done this start moving the bag around so the juices and ingredients all start to spread evenly and the salmon is fully coated for maximum flavour. You can then add the salmon to a baking tray and then allow the fish to cook thoroughly before serving. Note: Another option is to put the bag into a refrigerator for around half-an-hour prior to cooking, to allow the juices to really marinate the fish. 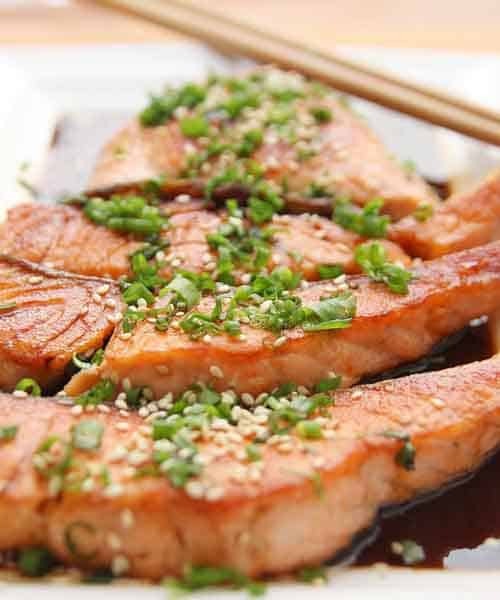 The third option is to grill your salmon which is another popular choice for many people, this step requires you to preheat your grill, and keep the temperature at a medium to high heat in order to give it those grill lines that run diagonally across the fish. Prepare your salmon in the usual way with some salt, pepper and oil and then place it diagonally on the grill (for those grill lines). Whereas oven cooking requires about 4-6 minutes per half-an-inch, grilling usually takes 3 – 4 minutes so keep that in mind when you are cooking under a grill. 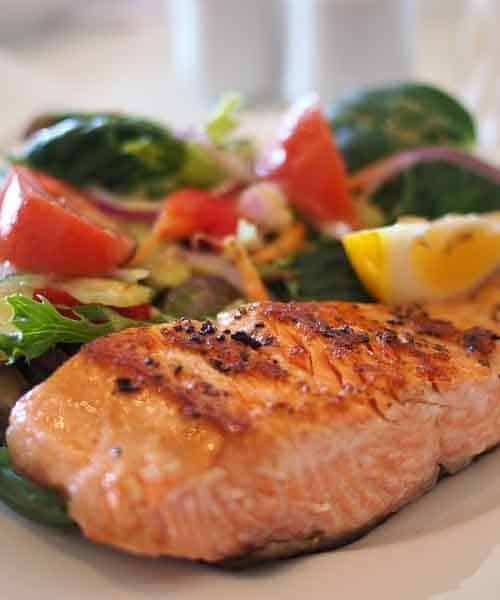 Usually you can cook a 1-inch thick piece of salmon in around 6 – 8 minutes (don’t overcook it). To make sure its cooked, look for that flakiness and make sure that the salmon I less opaque and more firm. Watch out for: Make sure your grill grate is well oiled as the salmon can easily stick to this and ruin your presentation. 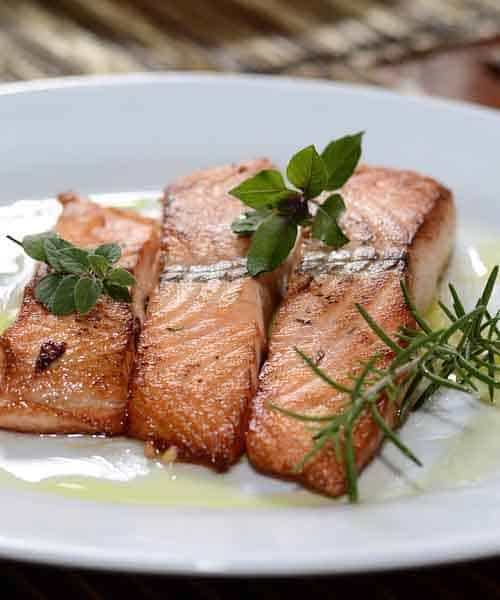 After grilling the salmon you can add yourself some lemon juice, and the serve it with herbs, broccoli or just eat it on its own as it came out of the grill…the choice really is yours! One method not used much is pan-searing, which can take as little as 6 minutes. All you need to do here is coat a frying pan in cooking spray or oil and then increase the heat to a medium level so its not smoking but it is hot. Add your salmon to the pan and then cook on both sides for 3 minutes. Again, you will need to check the salmon can flake in the center when you break it with a fork, and it should no longer be translucent to the eye. Tip: Use a spatula to pick the salmon us as tongs or any other kitchen tool will break it (especially if you need a good presentation). If you are not a fan of white rice or couscous then Quinoa could be the alternative you have been looking for, but take note that you need to cook it to perfection in order to benefit from its fluffy and light texture. 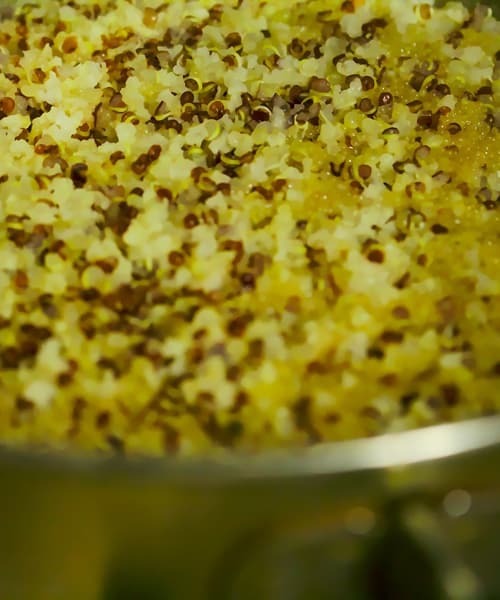 If you have already cooked couscous or rice before then you are half way there to getting the consistency right for Quinoa but we are going to give you a little helping hand by showing you some quick and effective tips to cooking it the best way. Put a saucepan onto your hob and turn up the heat to medium and add the 3 cups mentioned above to the pan. You want to keep them on a rolling low boil and cover the saucepan with a lid so the Qunoa is allowed to simmer. After about 15 minutes lift the lid and just check to see how things are going, what you want to see is most of the liquid being absorbed into the Quino, if there is still quite a bit of liquid leave the dish to simmer for another 5 minutes. Once cooked, take the saucepan of the heat and then fluff the Quinoa with a fork, it should be light a fluffy and enough for a good 3 servings (or 3 cupfuls). Using Quinoa in the same way can get boring, just like any other food type really. What you want to do is look for new ways you can enjoy this food, but bring out different tastes of this nutty delicacy. It may sound absurd but you can add a lot of flavour to Quinoa just by toasting it in a skillet and adding some oil. Do this for about 5 minutes so the uncooked Quinoa becomes a golden bronze color and then add it to the boiling water as you normally would (per our instructions above). Notice the taste difference? 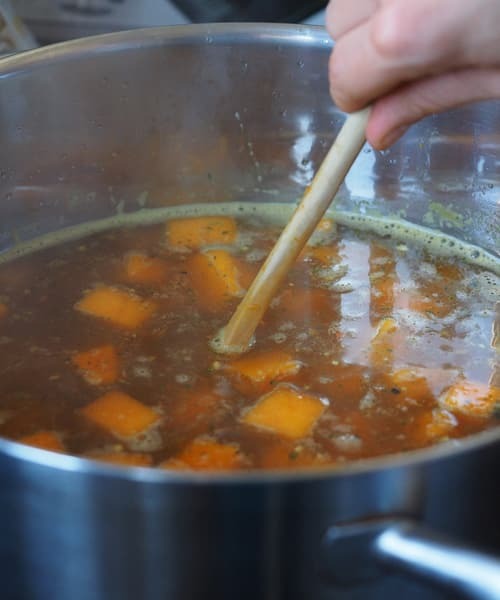 You don’t have to cook Quinoa in water, instead look for alternatives such as chicken stock or beef stock cubes that can give a little pizaz to the overall taste. Other flavors can include vegetable broths or mushroom broths, anything to add a little bit more excitement into your dish. Give it a try you won’t be disappointed. 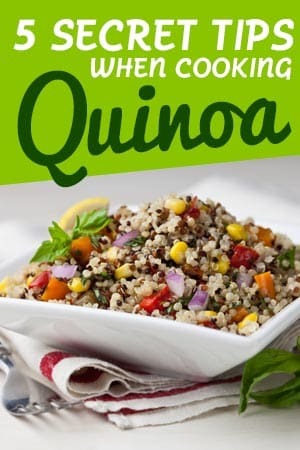 Oh no, you can actually use Quinoa to make a really tasty breakfast cereal, much like you would with oats. By adding aromatic spices such as cinnamon, nutmeg and ginger you can really bring out the best from Quinoa and enjoy it as your first meal of the day. Tip 4: Quinoa Lasagne Anyone? 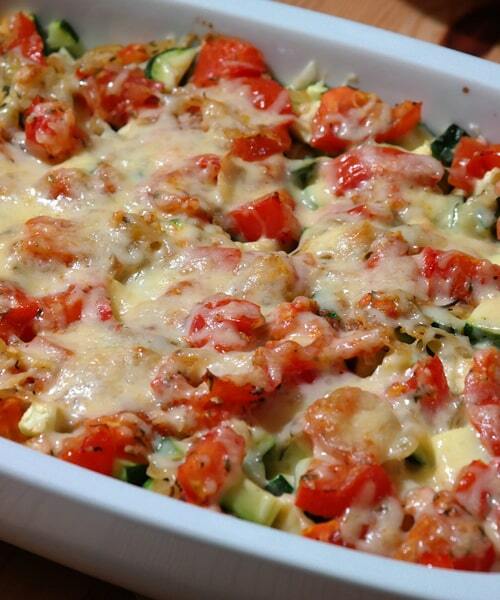 If you are a vegetarian then have you ever thought of a quinoa packed lasagne instead of meat-free or noodles? You can add cheese, herbs, vegetables and Quinoa to each layer of your lasagne and even thought it sounds stodgy it’s actually a very low calorie dish, and tasty too, Just give it a go and see what you think. This may sound like an obvious pointer but take it from us, it’s the most important because of the way Quinoa cooks. Usually if you follow the 2 cups of water and 1 cup of Quinoa instructions it takes 15-20 minutes to cook on the correct heat, but don’t just take that for granted. 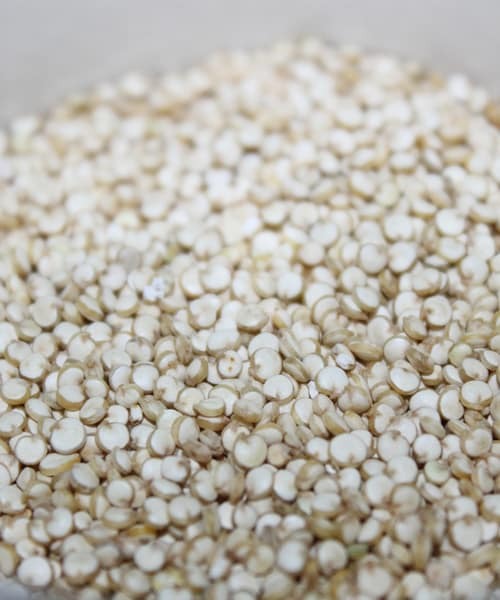 Always lift the lid to make sure that your Quinoa isn’t drying out too much, or the water isn’t being absorbed as quickly as you need it to. Cooking Quinoa can take some practice, but like anything, the more you do it the better you are going to become by learning from your previous attempts. 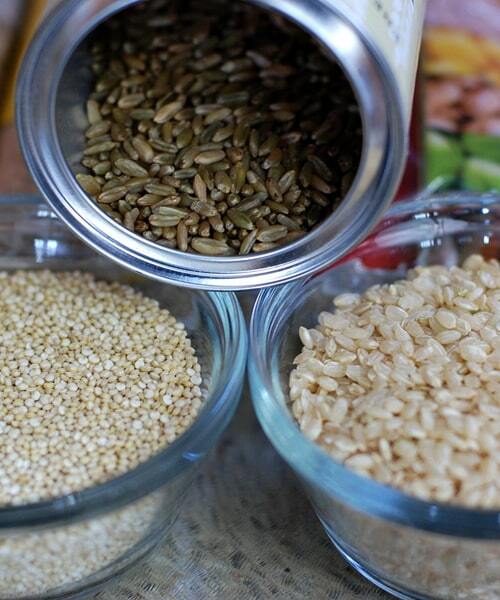 Soon enough you will be cooking the perfect Quinoa dish before you realize it.